【IDEAL SIZE】: 17\"x12\" page size, Not too big, Not too small, ruled DAILY BLOCKS provide plenty of room for NOTES. Each daily block is W2.16″ x H1.65″. Used THICK, quality paper to REDUCE INK BLEED. Prevents bleed-through with markers. 【BEAUTIFUL DESIGNS EACH MONTH】: Each month has itself unique beautiful pattern. Have a calendar that adds to your decor. Each page is perforated to tear away easily. 【ECO-FRIENDLY PAPER】: Quality post-consumer eco-friendly recycled paper, with a special thickness to ensure ink will not bleed through on high-quality white paper for a clean writing space . 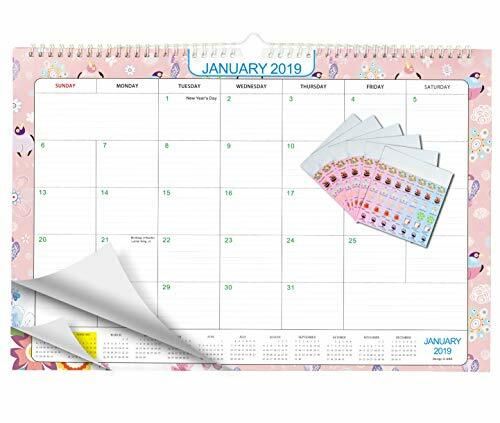 【COLORFUL STICKERS】: Two sheets of Circle and heart COLORFUL STICKERS to ensure your goal tracking and special events interesting as plain as daylight. Great quality and variety of colors!